December! I am starting to get quite excited for the end of the year and its associated festivities. Christmas isn't really evident in my kitchen yet, but it is very evident in London. Community markets are popping up everywhere, and I am spoilt for choice with outdoor ice skating rinks. I'm sure my kitchen will be Christmassy before long, but in the mean time, here are some of the other things happening in it this month. I had trouble deciding what to purchase, so also took home an iced raspberry and pistachio baked doughnut. I haven't really got into the recent doughnut craze, but this was very good, even eaten the day after purchase. Mr Bite bought an amazing chocolate cake from the markets too, from a non-vegan stall whose name I neglected to record. I'm sorry about that, because he said it was very good. The icing certainly looked amazing. Moving away from sweet things, my kitchen has also featured lots of aubergine (eggplant). It has been included in a few of my recent recipes, and ever since trying Gourmet Burger Kitchen's 'hippy dippy' burger, I have been obsessed with the combination of aubergine, pineapple and tahini. It's hard to believe that a few years ago, I rarely ate aubergine and was pretty unsure about cooking it. These days I just throw it in the oven, or on a grill, or in a non-stick pan with whatever I want to flavour it with. ...and some 'green superfood' powder sachets from the American company Amazing Grass. I have the original flavour, which combines greens (like spirulina, spinach and wheat grass) with fruit flavours (including pineapple and raspberry) and maca and acai. They will be great for keeping green smoothies in rotation across the winter months! 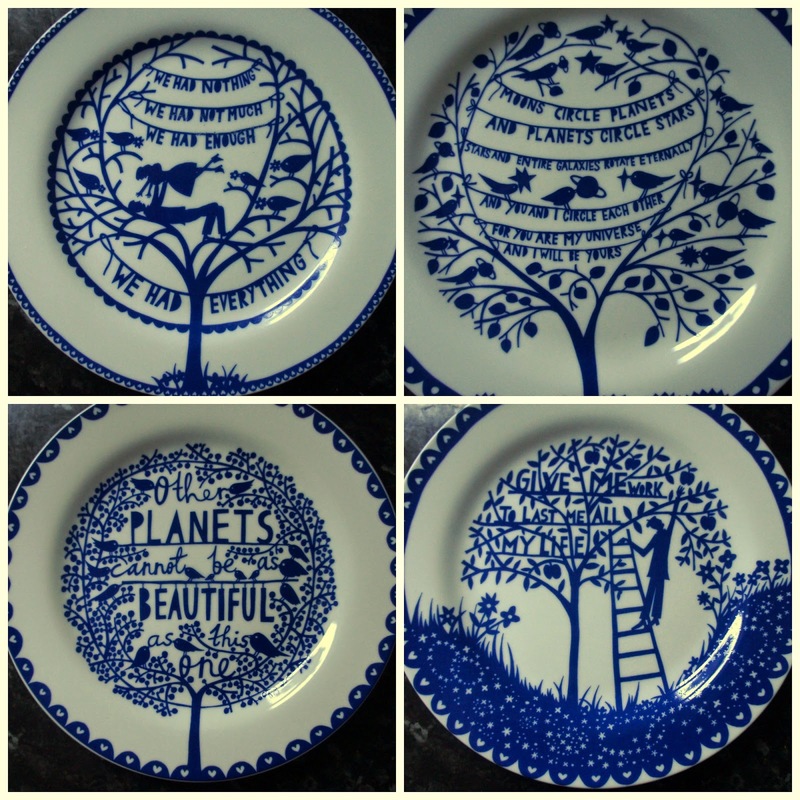 Last but not least, my kitchen has some favourite plates. These are not new, but often receive comments when I use them in photos. A few of you have wondered what the plates show (as typically I photograph them with food) so I've included them below. The plates were a wedding gift from my brother and sister and represent the four seasons. They're made by Rob Ryan, who makes other gorgeous crockery too. Thanks Charlie! And yes, that cake did sum up what I think chocolate cake ought to be. The plates are beautiful, what a lovely present! I've only recently made friends with aubergine and I now love it roasted in the oven. Wow, that doughnut... and those plates. So pretty. Aren't they just. I should have photographed the doughnut on the plate! G'day Gorgeous plates that bring back so many childhood memories! Thanks also for this month's kitchen view too! Thanks for stopping my Joanne - I am off to check out your kitchen now. I need to get me some Rubys - it all looks so good. I love your blue and white plates. Those sweet treats look amazing and I adore those plates! The plates look beautiful, I can see why you get a lot of comments about them. Aubergine is something I enjoy but for some reason don't cook at home much. I'll have to get back into that, pineapple does sound like a great compliment to it. I find pineapple complements a lot of things, but aubergine is a particular hit! Everything in your kitchen looks relish this month! those plates are gorgeous! I need to branch out more with eggplant as I only seems to eat it when i make eggplant parmigiana! Thanks for the inspiration! Funnily enough, I have never had eggplant parmigiana! It is such a versatile vegetable. I love Rubys - so many pretty things to eat - almost as pretty as those plates! Ha, yes - I am trying to fit in but confess eggplant still comes more naturally ;) Thanks for stopping by and I hope you are enjoying the sunshine now you're back in the summery Christmas season. oh yes gorgeous plates. i love kitchenware with typography. i am a huge fan of eggplants. nothing better than a smoky baba ganoush is there? i intend to make relish with them this Xmas; i was planning to do that last xmas so i must finally get around to it. Merry xmas to you.